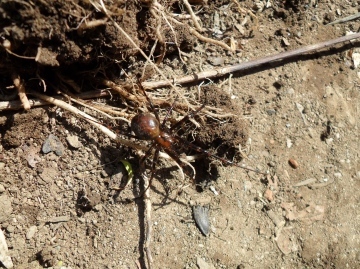 I think I will leave it where it is and be happy to know I have cave spiders in my compost bin. It seems unfair to put it through being posted around the country and risk it's life to the Royal Mail! I may try and find someone local to identify it with minimal disturbance, but thank you very much for your offer. If it is adult it would probably be possible to identify it alive. If not yet adult, it would need to be reared until it matured. Yes it could be returned to you, but you are bound to have more than 2 even if only somewhere close by. Thank you. Would it be harmed by trying to identify it - does it have to be dead? If not, would you return it home to me? I only seem to have 2, so that's 50% of my 'colony'! You are welcome to post the larger one which may be adult to me at 32 Lodge Lane, Grays, Essex RM16 2YP. It would be fine inside a small plastic container inside a padded envelope with a little slightly dampened tissue. How exciting! Thank you for the information. How do I go about finding someone in my area who may be able to identify it - assuming this could be done without hurting them? I checked in the bin late last night, to make sure the move hadn't upset them too much, and they were both hanging upside down in scanty webs. The larger one is very impressive! Julie. Yes, this is one of the cave spiders Meta species. It is most likely to be Meta menardi as you suggest, but microscopical examination of an adult is needed for certain identification, and it could possibly be the scarcer Meta bourneti. 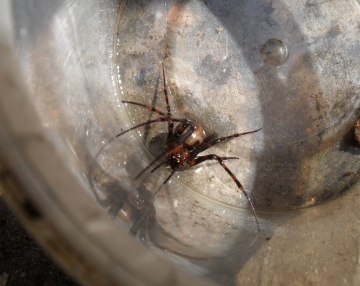 Hello, I was relocating a disused compost bin today and a rather large and impresssive spider came out, very shiny and with distinctive red markings on its legs. I have tried to identify it and think it may be Meta menardi. I wonder if the large, mostly empty and very dark compost bin is cave-like enough to be an attractive home to this species? I am in Cumbria, postcode CA10 2RW, grid reference NY508161. There was another one in the bin, which is now in its new location with both spiders safely back inside. Thank you, Julie.